The following pages offer a wealth of information concerning what to expect before, during, and after amputation surgery. The most important goal of your entire treatment—from the operation to rehabilitation, to the fitting of your prosthesis—is to restore your mobility. Your therapy team, which includes your doctors, therapists, prosthetists—and of course, you and your loved ones—will help you achieve the most independence possible, so that you can lead an active and mobile life. On average, this rehabilitation process takes between two to six months, although this can be affected by various factors, including your level of motivation and how well your prosthesis fits. Recommendations with regard to your therapy and rehabilitation are provided below. However, the instructions from your rehabilitation team always take priority since this team is best able to evaluate your individual situation. Whether you’ve known about your amputation surgery for a while, or just found out, remember that you’re not alone. Your treatment team is there to support you, answer questions—and find the best solutions for you. If you are to undergo planned amputation surgery, you will be examined in detail several times before the surgery. Your doctors will explain what will happen both during and after the operation. Of course, if you’ve had a traumatic accident, your conversations will occur after the surgery. During these discussions, you have the opportunity to ask any questions which are important to you. It’s a good idea to take notes of what you want to ask the doctor before the discussions so that you don't forget anything. Remember that it’s their job to explain it all clearly to you. If possible, you should begin doing those therapy exercises you’ll use after amputation surgery before your surgery takes place. That way you can strengthen your muscles in advance. It also makes sense to practice moving properly from the bed to the wheelchair as soon as possible. The timely training of such activities can make the time after the operation considerably easier on you. Ask your doctor and your physical therapist which exercises are right for you. It’s also a good idea to talk to a prosthetist before the amputation about which types of prostheses might be right for you. An amputation is a big change in your life and it may be helpful to get psychological counseling. Counseling can help you work through any issues or fears you may have, while taking some of the weight off of your friends and family—and yourself. 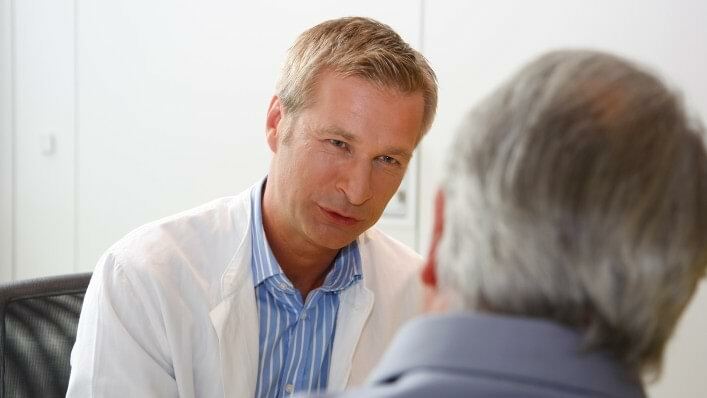 We also recommend that you talk with peers who have also undergone amputation surgery. It is good to hear how others deal with the situation, and in many cases they’ll also be able to share tips on everything from using your prosthesis to getting the right fit. Talk to your therapy team about how best to get in contact with peer support groups. Find out more about what ‘amputation’ means, including types of amputation and possible causes of amputation. What does ‘amputation’ mean, and why is it done? Amputation is described as the separation of a bone in healthy tissue or the removal of a limb at a joint (exarticulation). Amputation surgery may be necessary if an injured or diseased limb is not expected to heal and if the patient's life is endangered as a result. Possible causes include circulation issues, infections, accidents, cancer, or a congenital malformation of the limb. In these cases, it is usually known well in advance that an amputation will become necessary. In contrast, sometimes it is necessary to amputate unexpectedly, for example due to a severe injury after an accident. What does ‘amputation level’ mean? The term amputation level is used to describe the location at which the body part is amputated. The amputation level is determined by the doctor before the operation and is based on the reason for the amputation. For planned interventions, a prosthetist is normally consulted as well in order to clarify which amputation level is suitable for subsequent fitting of the prosthesis. Over twelve different amputation levels are common in the foot area. They range from a toe amputation to a metatarsal amputation or amputations in the tarsal area. When there is less need for—or difficulty in fitting—a prosthesis that offers increased function, Cosmetic silicone prostheses are sometimes used. 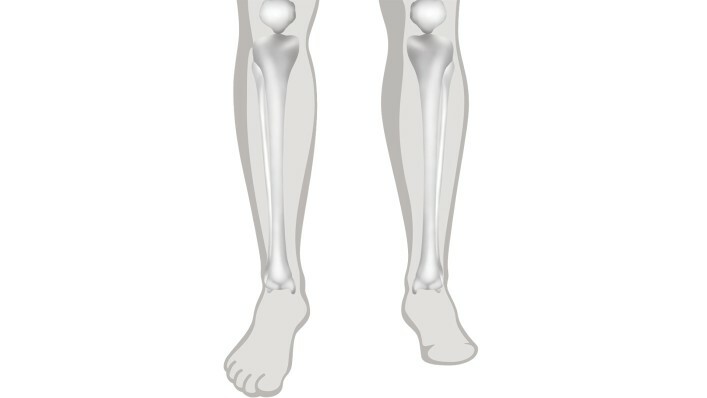 For transtibial (also known as ‘Below the Knee’ or ‘BK’) amputations, the amputation occurs through the tibia and fibula bones of the lower leg. The transtibial prosthesis consists of a socket, which contains the residual limb (the amputated limb, colloquially referred to as the ‘stump’), a prosthetic foot as well as adapters and connecting elements. Information on these products is available here. A prosthesis can be disguised with a cosmetic cover so that it is hardly noticeable visually. 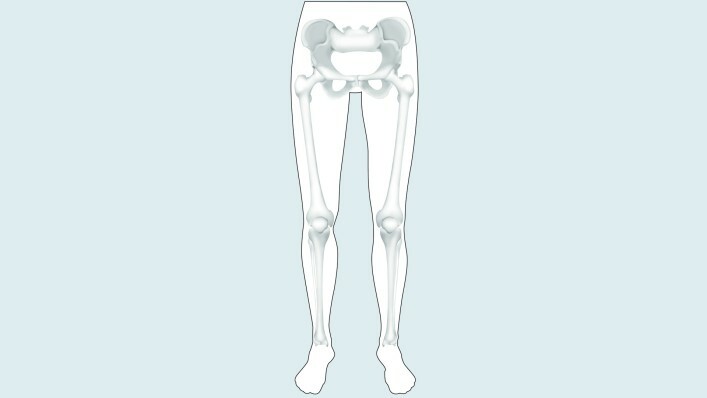 In knee disarticulation surgery the knee joint is separated and the lower leg is removed. The entire thigh is retained in the process. The prosthesis consists of a socket, which contains the residual limb (the amputated limb, colloquially referred to as the ‘stump’), a prosthetic knee joint, and a prosthetic foot, as well as adapters and connecting elements. Information on these products is available here. A prosthesis can be disguised with a cosmetic cover so that it is hardly noticeable visually. In a transfemoral amputation (also known as ‘Above the Knee’, or ‘AK’), the amputation occurs through the femur, or thigh bone, of the upper leg, so that the knee is no longer present. During a hip disarticulation, the amputation is performed in the hip joint area. With this amputation the pelvis will be used to control the prosthesis later on. 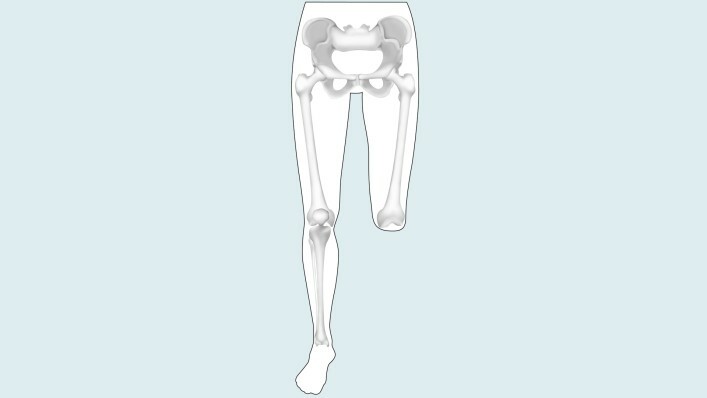 The prosthesis consists of a socket, which contains the pelvic area, a prosthetic hip joint, a prosthetic knee joint, and a prosthetic foot, as well as adapters and connecting elements. Information on these products is available here. A prosthesis can be disguised with a cosmetic cover so that it is hardly noticeable visually. 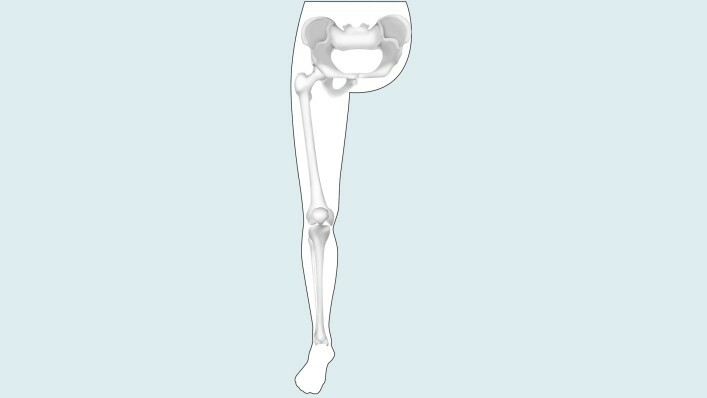 In a hemipelvectomy, the entire leg, and part of the pelvis up to the sacrum are amputated. With this amputation the pelvis will be used to control the prosthesis later on. 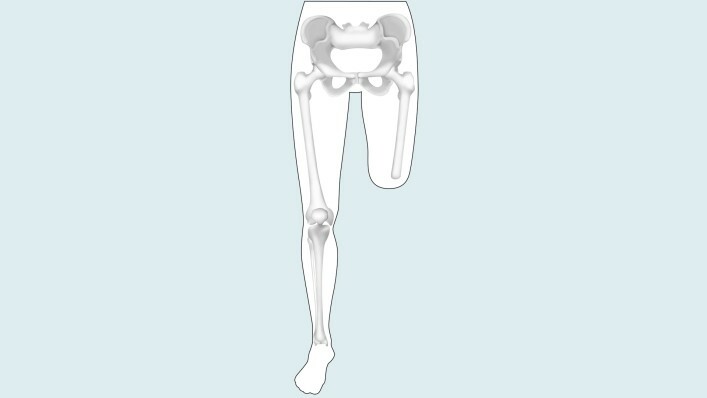 The prosthesis consists of a specialized socket, which contains the remaining pelvic area, a prosthetic hip joint, a prosthetic knee joint, and a prosthetic foot, as well as adapters and connecting elements. Information on these products is available here. A prosthesis can be disguised with a cosmetic cover so that it is hardly noticeable visually. Immediately after the operation, the focus will be on your recovery and the healing of your residual limb. Both are important so that you can start rehabilitation soon and be fitted with a prosthesis. What should you expect after an amputation? After the amputation your residual limb will be treated with a special wound healing bandage. Your doctor's main goal here is to quickly heal the wound that was caused by the operation and to prepare your residual limb for your future prosthesis. The focus during the initial period after the operation is on three treatment goals: You should have little to no pain, your residual limb should be able to bear weight, and you should be able to move your residual limb optimally in all directions. In order for all of this to succeed, it is important for you to have your doctor or physical therapist show you a few important things right after the operation. This includes correct positioning in bed so that the muscles and the joint adjacent to the residual limb don't retract or become stiff, as well as regular exercise. These measures allow you to be fit more quickly and easily with a prosthesis so that you can remain mobile and active. Immediately after the operation you will probably not be able to lie still for longer periods or to turn over in bed by yourself. For this reason, have the nursing staff help you shift position several times a day. This change of position is important, since it allows you to ensure the most pain-free position and helps prevent bedsores. It also helps to prevent flexion contractures—a limiting in your range of motion at the hip or knee—which could make rehabilitation more difficult. When you wake up from the anesthesia, your leg will have likely been treated with simple bandages or a plaster cast with a small drainage tube leading out of it. This tube was laid into the wound during the operation so that wound seepage and blood can flow out of the wound, and will be removed from the wound during the healing process. In most cases the amputation wound closes and forms a scar within the first three to four weeks. But even if the scar looks like it has healed well from the outside and only the color of the scar tissue is changing slightly, complete healing of the scar will take significantly longer. It takes about one and a half years until it has healed completely on the inside as well. During this period compression therapy and skin care creams are enormously important in helping the scar tissue remain soft and pliable—while simultaneously developing the ability to bear weight so that it’s possible to wear the prosthesis. With the aid of pressure applied to the residual limb over a large surface area, swelling (edema) of the residual limb can be reduced and the residual limb can be formed for the future prosthetic fitting. This compression of the residual limb contributes to being able to do your prosthetic fitting as soon as possible and to making it easier to adjust your prosthesis. In addition, compression aids circulation in the residual limb. This reduces the amount of pain and results in improved healing of the scar. Various techniques are used for compression therapy: The residual limb may be wrapped with an elastic bandage, or compression socks or a prefabricated silicone liner may be worn. Compression bandages are applied using a special wrapping technique after the wound bandage or residual limb cast is removed. During the first few days and weeks after the operation, your residual limb will be bandaged by your therapist or by the nursing staff. This somewhat elaborate compression involving elastic bandages can be customized to your individual residual limb amputation level. The bandage will be removed frequently (initially as often as every half hour) in order to make sure the residual limb was not wrapped too tightly or too loosely. The caregiver will also check to see how the residual limb is developing, whether the edema is getting better, and how the scar is healing. After sufficient healing, the compression bandage may only be worn for several hours at a time, for example also before and after wearing an interim prosthesis. Later on, your caregivers can show you how to apply the compression bandage yourself. Make sure you have the wrapping process explained to you in detail in order to avoid mistakes which could lead to renewed swelling of the residual limb, or to irritation or injury made by folds in the bandage or wrapping that’s too tight. To avoid injurying your sensitive residual limb, use tape on the bandages instead of metal clips. It is also important that you clean the bandages thoroughly. Since the bandages absorb sweat, they should be washed daily with a mild detergent or a mild soap. Remove the majority of the water by rolling them up gently in a towel, then lay them out flat to dry. Do not hang the bandages up to dry, as this can affect their elasticity. You have to wear your compression bandages until your residual limb is fully healed. As soon as everything has healed, you can try sleeping through a night without wearing the bandage, but only after consultation with your doctor, prosthetist, or physical therapist. However, if you experience a lot of swelling in the residual limb the next morning, you should continue with the compression therapy. Compression socks can also be used instead of bandages. The socks are also elastic and available in various sizes. Custom sizes can also be made if the standard sizes do not fit you. Like elastic bandages, the socks must be washed daily and laid out to dry so that they do not lose their elasticity. The advantage of residual limb socks is that they are easy to put on and take off. You can use suspenders attached to a hip belt to hold the socks up. Or you can use a pelvic band which is fastened permanently to the sock. In addition to elastic bandages and residual limb socks, silicone liners offer a further method for achieving compression. Similar to residual limb socks, silicone liners are available in standard sizes as well as customized fabrications. The liner exerts even pressure on your residual limb and forms it properly. In addition, the flexible, skin-friendly silicone can help make the scar soft and pliable. To put the liner on, it is best to first turn it inside out and then roll it evenly onto your residual limb. Don’t pull it up like a sock, and take special care to ensure that no folds or air pockets form. Clean your liner daily with a skin-friendly, unscented soap and warm water. If you sweat a lot, you should clean it several times a day and possibly use a disinfectant. Have your prosthetist explain the care of your liner in detail and follow directions in your user’s manual. Although the nursing staff and the doctors were initially cleaning the wound and changing the bandages, now that you are in the rehabilitation phase you will be caring for your residual limb and your sound leg yourself. Your therapist will show you how to properly care for your residual limb. In order to prevent the skin from becoming rough and scaly, wash the residual limb with warm water and a mild soap (such as Derma Clean) every morning and evening. Then dry the skin thoroughly or carefully dab it dry and put cream on it. Derma Repair and Derma Prevent, two products from Ottobock, were developed specifically to care for highly stressed skin such as that on a residual limb. The Derma Prevent cream, for example, guards against chafing by covering the skin like a protective film keeping it soft and pliable. If folds of skin or retracted scars, also known as invaginations, have formed on the residual limb, they must receive particularly intensive care in order to prevent infections. Have your rehabilitation team advise you in this regard. In addition, look out for injuries, pressure sores, and blisters while you care for your residual limb. These must receive medical treatment. A mirror can help you look at the back of your residual limb. Regular massaging and careful stretching of the scar is another important component of residual limb care. Also note that putting the prosthesis on in the morning right after you wash is often more difficult than usual, since warm water causes the skin on the residual limb to swell. 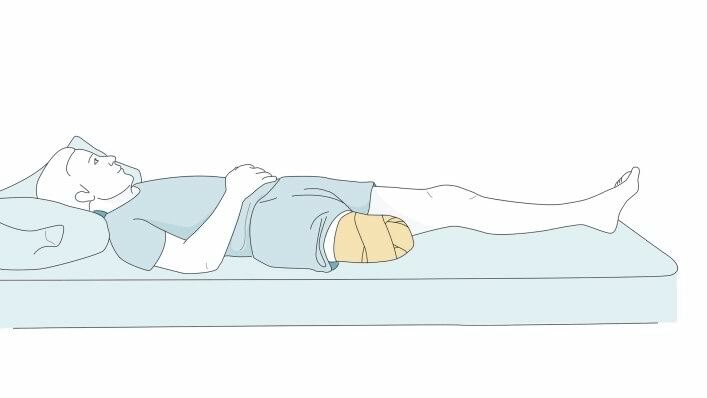 After the amputation, when the residual limb is not yet able to bear a lot of weight, it’s common to put more weight—and stress—on the sound leg. Work with your care team to find the best ways to keep you sound side healthy. In order for your body to be well prepared for the next treatment steps and so that you remain mobile, exercises to strengthen the trunk, arm, and leg muscles are highly recommended. 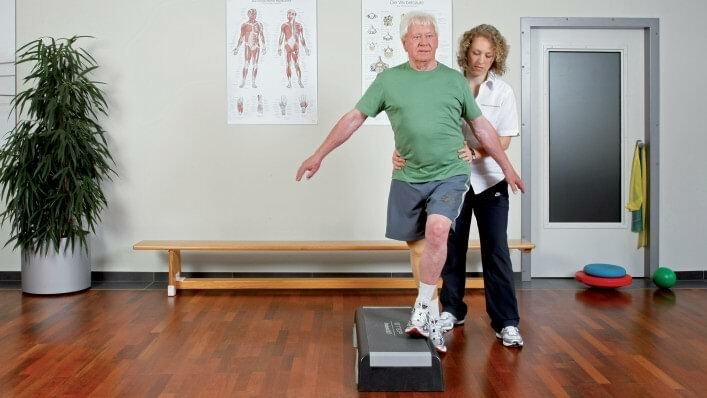 Have your physical therapist show you exercises which support your recovery and also train the joints near the amputation location as much as possible. You may also want to practice sitting up in bed and making transfers to a wheelchair. In some cases, an initial prosthesis may be fit about 10 days after a lower limb amputation. With such an immediate fitting, some weight can be applied to the residual limb early on and the first walking exercises can be started. However, this type of prosthesis is not suited to all amputations. Your doctor, physiotherapist, and prosthetist will decide together if this is an option for you. If such an early fitting is possible for you, you will receive an interim prosthesis, which is designed for initial walking and standing exercises. Your treatment team will decide when you can start with intensive rehabilitation based on how your recovery is going. During your rehabilitation process, you’ll be fit with a prosthesis tailored to your specific needs, and supported by a rehabilitation team that could include doctors, physical and occupational therapists, a prosthetist and nursing staff. These professionals are there to support you and to ensure that you are well prepared. During rehabilitation you will learn how to properly care for your residual limb, as well as the rest of your body. Before you can wear a prosthesis, your residual limb must be healed and have attained the proper shape. This means that all fluids that accumulated due to the operation have been removed through compression therapy and that the residual limb edema has subsided. Once your residual limb has been properly formed and can bear weight, you may be fitted with an early or interim prosthesis. Then you’ll begin to practice using your prosthetic leg. At first you’ll learn how to put the prosthesis on and take it off as well as take care of it. Later, you’ll learn how to walk with the prosthesis, which is known as gait training. After your amputation you should be fitted with the best prosthesis for your needs. Things that influence selection of a suitable prosthesis for you include your level of physical fitness and health, the amputation level, the demands you place on the prosthesis and your professional and private environment. Your prosthesis will help restore a large part of your mobility and contribute to your ability to manage your life without help from others. By wearing your prosthesis, you’ll help avoid postural and balance problems that can arise due to the missing weight of your amputated leg. In addition, you also avoid excessive strain and long-term damage to your sound leg by wearing your prosthesis. Once your residual limb has healed and you are in good health again, the process of fitting your final prosthesis will begin. Even before this stage, however, your prosthetist will likely meet with you in order to better understand your needs and wishes. In addition, he or she will assess your residual limb shortly after the amputation and find out if an interim prosthesis is appropriate for you. 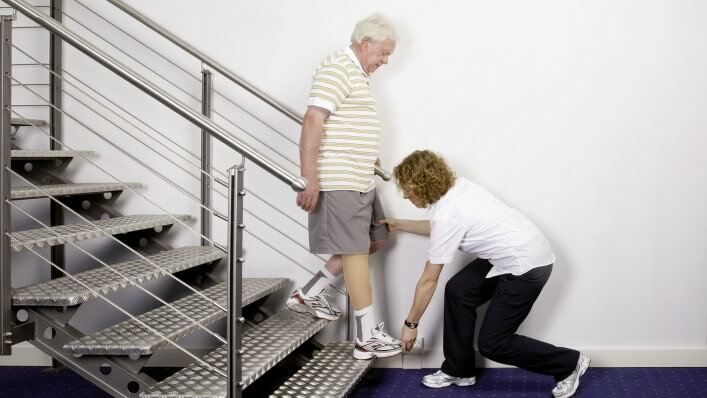 An interim prosthesis helps you to perform standing and walking exercises early on. In addition, your prosthetist gets to know your individual ideas and needs, which provides them with important information about which prosthetic components are suited to you. They will then fit the prosthetic socket, and adjust the prosthesis to your unique needs. After your the prosthetic components for you have been determined, the prosthetic socket will be made and then finally aligned to best fit your walking style and ability. The proper fit of the socket is extremely important—just like a shoe, if it doesn’t fit well you won’t be able to walk correctly. Just as important is the alignment of the prosthesis, which can determine whether you walk with a correct, efficient, and comfortable gait. You may undergo several trial fitting to make sure the socket and alignment are correct. Be patient with the process—your prosthetist will be working hard to make sure everything works as well as possible. The functionality provided by prosthetic components such as prosthetic feet and prosthetic knee joints can vary a lot. This means that it’s important to select the right prosthetic components. These components and targeted training in how to use them are decisive factors in allowing you to achieve your individual therapy goals. The goal of rehabilitation training with a physical therapist is to help you gain as much mobility and independence as possible. Your therapist will help you learn how to use your prosthesis properly. This includes putting the prosthesis on and taking it off, getting up and sitting down, and balance and gait training. 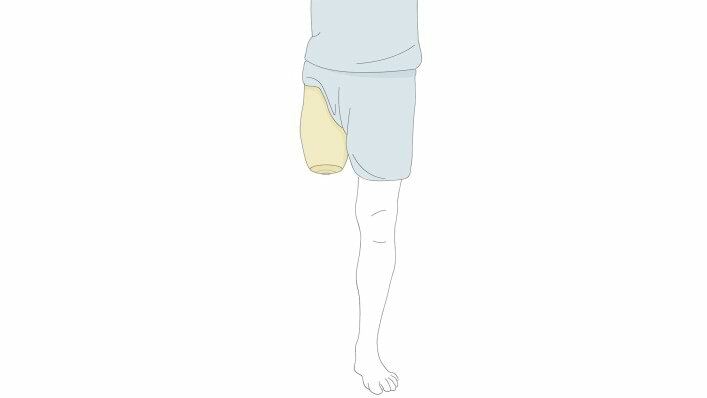 Correctly putting your prosthesis on (donning) and taking it off (doffing) by yourself is an important everyday task. Your family or friends may need to help you initially, but the goal is for you to ultimately be able to do this on your own. There are many different ways to put your prosthesis depending on the type of prosthesis you have and the condition of your residual limb. Your therapist will show you which ones are suitable for you. You have already learned to care for your residual limb, but your prosthesis must also be cared for and cleaned every day, too. Wipe the inside of the socket with a moist cloth to remove sweat residue and skin particles. Keeping the contact surface with the skin clean helps to avoid skin irritation. If you wear a liner, please care for it daily according to the user manual. In addition, you should continue strengthening your muscles, since strong muscles are an important prerequisite for a stable posture while walking. First you will learn to shift your body weight while using the parallel bars and to stand on one leg. You’ll need to learn to trust your prosthesis, and not to put all your weight on your arms and your sound leg. After you’ve gotten confident walking in the in the parallel bars, you’ll begin to walk in open space. You’ll goal is to reduce your need for walking aids, bit by bit. You can achieve this through a combination of the using the right walking technique and by strengthening your trunk muscles. It’s important to use proper form while doing the exercise. Your therapist will help you at first, until you’re able to do it on your own. On any given day you’re sure to encounter obstacles, such as curbs, steps in the house, sloped surfaces at garage entrances, and so on. Here, the components in your prosthesis are particularly important since different prosthetic knee joints require different walking techniques. Correct positioning of the foot or the use of the handrail, for example, also play an important role. After putting it on and taking it off correctly, sitting down and getting up are the next everyday movements you will learn. The exercises for this are based on the components which were used in your prosthesis. 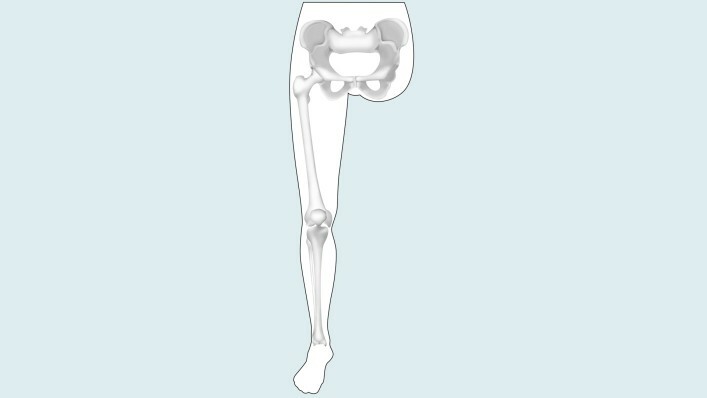 With an Above Knee (transfemoral) prosthesis using the C-Leg knee joint, for example, it is possible to place weight on both legs while lowering yourself to a seated position. This is a significant factor in reducing strain on the sound side, helping to reduce overuse. For the same reason, you should place weight equally on both legs while sitting down and getting up with a transtibial (below knee) prosthesis. Great training info for improving balance and keeping your core strong. Download this ‘Trunk Strengthening and Muscle and Coordination Exercises for Lower Limb Amputees’ therapy protocol and ask your prosthetist or physical therapist about whether the exercises in it are right for you. It’s a great resource and could get you both fitter and walking better! The loss of one or more limbs raises a lot of questions. We’ve compiled answers to some of the more common questions here. If you don't find the answer to one of your questions here, ask your prosthetist, therapist, or doctor. Your rehabilitation team is best able to evaluate your individual situation. Why do I have pain in my residual limb? What can I do about it? Different types of pain can occur in a residual limb after an amputation. These can include, among other things, bone pain, wound pain, nerve pain or phantom pain. The pain is treated correspondingly depending on the cause (for example, with medication, heat/cooling, or residual limb bandaging). Talk to your therapy team about steps you can take to limit or do away with the pain. If I touch the skin on my residual limb, it feels “strange” there. What can I do about it? After an amputation, sensitivity problems can occur on the residual limb. These unfamiliar sensations often normalize by themselves after a while. However, you can speed up this process by stroking the skin of your residual limb with a terry towel or a soft brush. Your therapy team will likely have other suggestions about steps you can take. Why can&#39;t I get a prosthesis right after the amputation? Your residual limb is still swollen and the skin is sensitive after the operation. It’s also important that the wound can heal “in peace”. 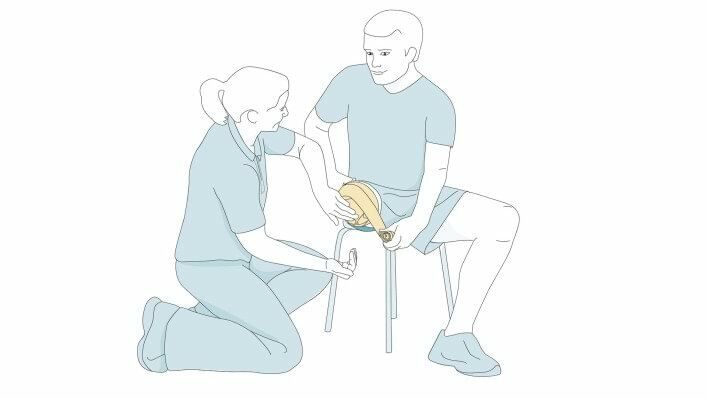 To get into your prosthesis as soon as possible after amputation surgery, work closely with your team and do the rehabilitation exercises consistently. How long will it take before I master the prosthesis completely? How long you require in order to tap the full potential of your prosthesis depends on many factors, including the reason for the amputation, amputation level, condition of the residual limb, and your overall ability. Your motivation is also an important factor: If you begin preparing yourself for the prosthetic fitting shortly after the operation and train frequently and intensively with the prosthesis later on, you’ll contribute to reducing the time required to reach your personal goals. What do I have to consider when riding my bicycle with the prosthesis? Your ability to ride your bicycle depends on the amputation level and the type of prosthesis. In all cases, try riding on a stationary bicycle first and only switch to a normal bicycle after a successful experience with the stationary bicycle. Depending on your occupation, you can go back to work with your prosthesis. If you perform a job that is physically demanding, you should inform your prosthetist before your prosthesis is made, in order to best determine which components might be right for you. If your work involves extreme physical strain, you should let your prosthetist know before the pros¬thesis is fabricated, because the type of stress applied to the prosthesis affects the manufacturing of the socket, and the selection of components. Various terminal devices, such as the Ottobock System Greifer or Michelangelo Hand are recommended for specific tasks. How long will my prosthesis last? Will I require any new ‘parts’? When will I require a new prosthesis? In general, if the socket of your prosthesis fits well and you’re not having any difficulties, then you don't require a new prosthesis. You will likely, however, need new liners or limb socks on a regular basis. Talk to your prosthetist about which liners will work best for you and your prosthesis.